3herosoft iPad Mate is professional discount package of iPad software specially made for iPad users. It consists of 3 powerful tools, iPad Video Converter, DVD to iPad Converter and iPad to Computer Transfer. 3herosoft DVD to iPad Converter is professional DVD to iPad Converter specially designed for iPad users. It can easily convert DVD movies to iPad video MPEG-4, H.264/MPEG-4 AVC and iPad audio MP3, M4A, AAC with the latest H.264 video encoding technology. 3herosoft iPad Video Converter can convert almost all popular video files including AVI, DivX, XviD, WMV, MPEG, MPG, DAT, RM, MOV, ASF, VOB, FLV to iPad MPEG-4, H.264/MPEG-4 AVC video and iPad MP3, M4A, AAC audio. It acts as a WMV to iPad Movie Converter, AVI to iPad Movie Converter, FLV to iPad Movie Converter. License Type: Free to try, $48.00 to buy. iTunes - iTunes 9.1 or above is required. iTunes - To support iPhone OS 3.1, iPod nano 5G FW 1.0, iTunes 9.0 or above is required. iTunes - To support iOS 4.0.2, iTunes 9.2 or above is required. iTunes - To support iOS 4.1, iTunes 10 or above is required. iTunes - To support iOS 4.2, iTunes 10.1 or above is required. iTunes - To support iOS 4.3, iTunes 10.2 or above is required. iTunes - To support iOS 5, iTunes 10.5 or above is required. 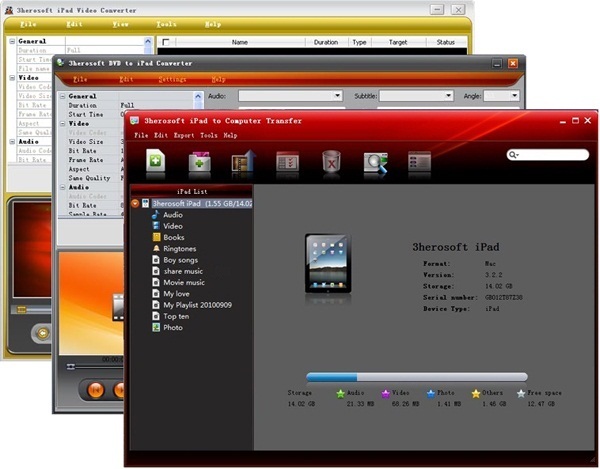 The iPad Mate includes three powerful tools: 3herosoft iPad Video Converter, 3herosoft DVD to iPad Converter, 3herosoft iPad to Computer Transfer. Convert movie DVD to iPad MPEG-4, H.264/MPEG-4 AVC video and iPad MP3, M4A, AAC audio formats. Convert all video formats like AVI, MKV, FLV, VOB, MPEG to iPad MPEG-4, H.264/MPEG-4 AVC video and iPad MP3, M4A, AAC audio formats. Transfer iPad music, video, photo, ePub, pdf, Audiobook, Podcast and TV Show from iPad to computer for backup. Transfer iPhone ringtone, Voice Memos, Camera Roll, SMS, Contact, Call List from iPhone to computer with ease. Easily transfer music, video, Podcast, TV Show from computer to iPad without using iTunes. Fast get sync music, video, ePub, pdf, Audiobook, Podcase, TV Show with iPad to iTunes library for management easier. The output files can be played well on iPad, iPad 2, the new iPad, iPad 4, iPad mini, iPhone 3, iPhone 4, iPhone 5, iPhone 5S/5C, iPhone 6/6 Plus, iPod classic, iPod touch, iPod touch 4, iPod nano, iPod nano 5G, iPod nano 6G, iPod shuffle, iPod shuffle 6G and iPod mini. Customizing your own video with video and audio parameters setting including Video Encoder, Resolution, Frame Rate, Video Bit Rate and Audio Encoder, Sample Rate, Channel, Bit Rate, etc. User-friendly interface with available settings. Rip DVD and all popular videos to iPad with just a few clicks. 3herosoft iPad to Computer Transfer is easy-to-use iPad to Computer transfer, iPad rip, iPad backup software which can fast transfer your music, movie, photo, ePub, pdf, Audiobook, Podcast and TV Show between iPad and computer, also copy iPad files to iTunes library with no limitation. Fully keep compatible with iPad, iPad 2, the new iPad, iPad 4, iPad mini, iPhone 3, iPhone 4, iPhone 5, iPhone 5S/5C, iPhone 6/6 Plus, iPod classic, iPod touch, iPod touch 4, iPod nano, iPod nano 5G, iPod nano 6G, iPod shuffle, iPod shuffle 6G, and iPod mini. 3herosoft DVD to iPad Converter is powerful DVD to iPad Converter software which can easily convert DVD movies to iPad video MPEG-4, H.264/MPEG-4 AVC and iPad audio MP3, M4A, AAC in fast way. All types of devices are supported including iPad, iPad 2, the new iPad, iPad 4, iPad mini, iPod classic, iPod nano, iPod nano 5G, iPod nano 6G, iPod touch, iPod touch 4, iPhone 3, iPhone 4, iPhone 5, iPhone 5S/5C, iPhone 6/6 Plus. 3herosoft iPad Video Converter is a versatile iPad Video Converter which can convert videos to iPad video and audio formats, such as AVI to iPad, FLV to iPad, 3GP to iPad, MEPG to iPad, MKV to iPad, WMV to iPod. It can also extract iPad audio MP3, AAC, M4A from all popular videos and other audio formats. Why choose 3herosoft iPad Mate?